This semester Pam had the students read EATING while also working at the campus community garden. I teach Academic Literacy, a developmental reading and English course at Northampton Community College. This semester my students have had the experience of gardening while reading Where Am I Eating? We have an organic community garden on campus which has made this opportunity possible. It has been an absolutely fantastic learning experience for these young adults. Many of my students are either from Philadelphia or New York City and have never had any exposure to growing food. In the Spring semester while reading about the hardships of many of the farmers in Where Am I Eating?, my students actually planted their own food and experienced the farmers’ frustrations and challenges, as well as their rewards. We spent one class planting seeds indoors, then went several weeks later to study the seedlings’ progress. In April, the students planted their vegetables and flowers in the college’s community garden. During the last week of class, we went to the garden to see how their “babies” were adapting to their new outdoor environment. After each of these visits, the students wrote a journal entry reflecting on their physical and emotional responses to working with their plants. There was also a service learning component to the course: the students were required to spend one hour during the first week of April in the community garden helping the garden manager. These students have learned that farming is a science and that not all plants grow as expected. They have come to appreciate the needs of farmers in other countries that they have been reading about with regard to the importance of education about growing. In addition, my students have learned the surprising reality that plants are sharing the earth with us; we are not sharing the earth with them. Plants can survive without us, but we cannot survive without them. My students have a new appreciation for plants, growing, and the experiences of the farmers described in Where Am I Eating? 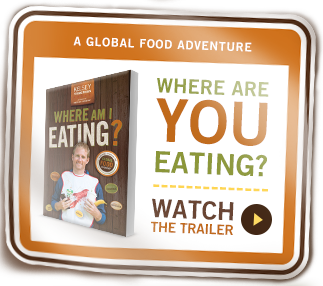 I very highly recommend this hands-on opportunity to help bring to life the experiences of the farmers Kelsey has introduced us to in Where Am I Eating?—if even in such a small way!